People really do love this book, but it was just average for me. 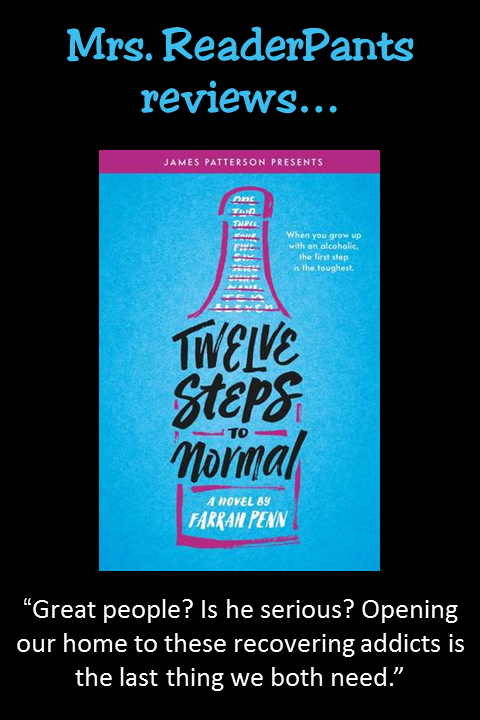 I appreciate the author's purpose for writing it (as a teen, she also struggled with an alcoholic parent), and I think there is an audience for it. It just wasn't for me. SUMMARY: At the start of her senior year, Kira has moved back in with her father after spending the past eleven months at her aunt's house in Portland. Kira's father is a recovering alcoholic, and Kira doesn't trust that he will stay sober this time. But Kira is excited to see her old friends and her ex-boyfriend Jay, who she reluctantly broke up with right before she left. But things are nothing like what Kira expected: Jay is now daing Kira's friend Whitney, and her dad has moved three complete strangers into their house. REVIEW: A lot of people like this book, but it just wasn't my cup of tea. The events are predictable and follow the arc of many YA realistic fiction stories. Kira is infuriatingly self-absorbed and bratty; I did not like her from the beginning. This is one of those books where lots of sentences begin with "I," a writing choice I do not care for. There were many, many unnecessary descriptions of people's clothing which, once I noticed it, I could not stop noticing. Every time a new person enters the room, we get to hear about what he or she is wearing. I liked the "recoverees" more than I liked Kira's excessive and condescending use of the word "recoverees." These are perfectly nice people who go out of their way to connect with Kira, and she repeatedly says and does mean things to them. I get that she's angry with her Dad, but these people have cooked for Kira, driven her places, and helped her with homework. Apparently, Kira would rather see them homeless than living in her (Dad's) large house and allowing her lonely father to have some nice friends who understand his struggles. Kira doesn't want her father to drink again, yet she thinks severing his friendships with people who understand him is a great plan to keep her father sober. Get over yourself, girl. I did like the sweet romance between Kira and childhood friend Alex. Jay was obviously a jerk from the start, but as happens so often in YA, Kira takes way too long to see that. And if social services and Kira's aunt are so involved with Kira (which they are), why on earth isn't Kira in Al-Anon and/or some kind of counseling? She needs it. THE BOTTOM LINE: Predictable with an annoying and selfish protagonist. Some will like it, and I'm sure many teens will identify with Kira's anger with her alcoholic father. STATUS IN MY LIBRARY: We don't have this book. I'll order it if someone requests it.